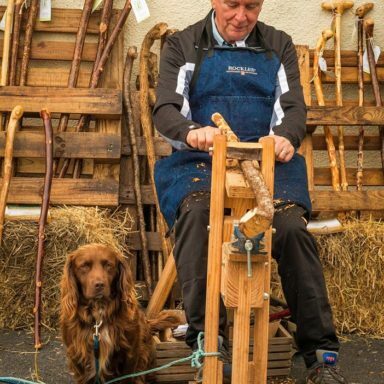 Derryhick Sticks makes one piece walking sticks and canes from a wide range of wood species. The end product is always a stick with its own unique look and character, one that the owner can establish an affinity with knowing that he/she will never see a copy with anyone else. Derryhick Stiks produces one piece walking sticks and canes from a wide range of wood species including Alder, Ash, Birch, Blackthorn, Elderberry, Hazel, Hawthorn, Holly, Privet and Rhododendron. We also produce sticks from Ivy and Gorse and Sycamore but, due to scarcity of suitable shanks, they are not always in stock. If you would like a walking stick for every day rustic country living, a once-off stick with a handle designed only by nature, a stick with its own unique characteristics, a stick that becomes your friend, a stick not just for admiring but for taking with you on a walk, then our sticks are definitely for you. Our sticks are produced from naturally grown shanks so the size and quality can vary significantly. Each handle has to be shaped, the shank is heated for some straightening (not a lot), then follows much boring sanding and, finally, several finishing coats are applied. Very few sticks will turn out to be blemish free. This is to be expected and natural cracks and colour variations must be accepted as normal characteristics. So, the slogan ‘Created by Nature – Finished by Hand’ accurately describes our sticks. We avoid the temptation to straighten them like billiard cues or to hide natural imperfections or other little idiosyncrasies. Instead we concentrate on shaping a comfortable grip on the handle. Once this is achieved we shave, sand and finish the shank to enhance whatever colour and grain that nature has given the stick.